It can be served as below 7 purpose aids 1. gamepad, 2. VR game remote, 3. wireless mouse, 4. Selfie shutter, 5. music control, 6. E-book flip page, 7. PPT presentation etc. Fully support Android system, partly Support iOS system, Windows System and so on. This nice remote controller will be your best choice to use High technology to change and convenience our daily life! More Operation instruction details please look through the image in this website page or in the Manual. 8. Shutdown current less 20uA. 1. When accident cause not boot or unable to shutdown, please use needle to take out the batteries. 2. If can't connect, please Press B+Y+Power button to Power On,then Power Off the device to restore factory settings. ✅6. Compatible Remote control, Fully support for Android system, window phone systems & very limit support for iOS system's VR game, mouse function is only for Android system. 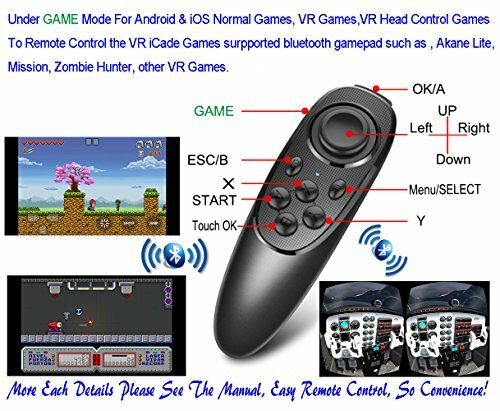 ✅7.Remarks: if you buy this remote for VR headset, then it's just an aid for our remote operating mobiles when mobile is in the vr headset and not easy to touch with hands, so we kindly remind respected buyers here that it could control vr videos playing and part of vr games, but could not control all vr games. Thank you.